Thousands of shopping bikes lined up on a huge street. A common sight in Japan at any given train station. However, I was not standing in front of a station but at the start of the Fuji Speedway Race Track where also Formula One races are held. 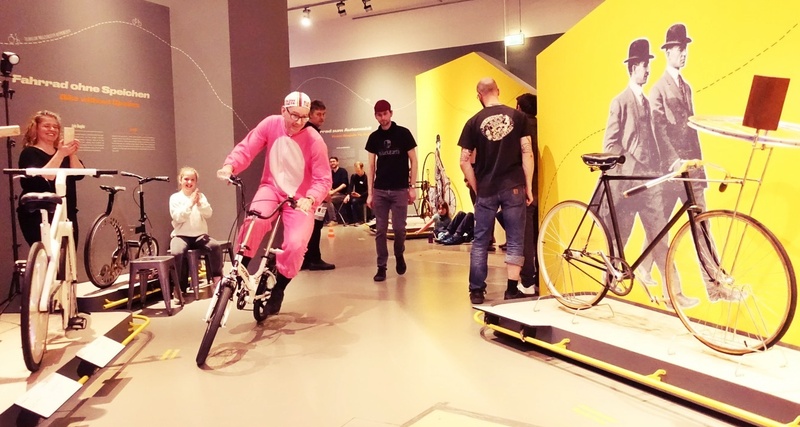 On Sunday, the Shopping Bike Grand Prix Race was held there. 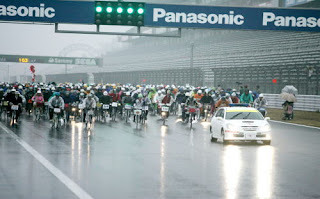 An interesting concept, bicycle races hold on the fastest circuit for the highest performing cars, with the lowest cost riding option available, a typical Japanese shopping bike or Mama-chari, which can be bought for approximately 10.000 - 20.000 JPY. The shopping bike is somehow the more expensive version of an umbrella in Japan. One tends to forget in front of a station but is perhaps not so much irritated about it and buys a new one immediately. It cost less than two Continental tires for my road racing bike. A must have is the shopping basket mounted over the front wheel. You need this for the optimal aerodynamic positioning. Ours had a three gear Shimano Nexus shifter. Others had none. It works differently than the shifters on road bikes. You need to turn the handle shifter at least 5 seconds before you actually want to shift and then pedal like hell. If you are lucky the shifter actually shifts when you need it. If you are not lucky, it doesn't. Or does too late. Most shopping bikes have a backwards curved handle. In combination with the low seat position this reminds you not to do anything imprudent. Ours luckily had a straight handle. The tire size is limited to 26 inch. The saddle post height can be adjusted from BOP to BAOP ("Bottoms on the pedals" to "Bottoms almost on the paddle. All bike have compact cranks (inner only). Sadly enough, I saw some bikes which had a 6 gears rear derailleur mounted and I can see the same tendency as in road biking: Upgrading the equipment as one is too lazy or simply cannot upgrade the performance of his own body. And that attendants are willing to spend a lot of money on high-grade shopping bikes. I am afraid that it will be only a matter of time when we will see aerodynamic optimized carbon shopping baskets, titan-made bicycle stands and Speedplay cleats for high heel shoes. I left the house early in the morning, at 4:30 hr to be precise, with our car. Otherwise my team members would have picked me up at 2:30 hr. "We need to avoid traffic congestion", was the logical argument. It took me about 90 minutes to arrive at Fuji Speedway, and the race started at 8:40 hr. So I guess my teammates had ample time between 4 and 8.30 hr to prepare themselves for the race. Japanese group organization - still not use how to cope with that after all these years here. Not that preparation is a bad thing. But it definitely is not much fun if it is pitch dark, the landscape is covered in snow and it is freezing cold. Plus there is nothing to do but to wait for the start of the race. I arrived at the parking lot of the Fuji Speedway and I thought that mistakenly I have driven my daughter to her figure skate training and parked in the middle of the ice rink. Because of the rain the night before, the road was frozen with water and it was almost impossible to walk. I could not even take my MTB up to the start: impossible to ride on it, impossible to go with it. Everybody was already there and the atmosphere was about the same as the temperature. I thought that we had already a huge amount of grilling and other equipment at our ground, but I saw some more things at our teams which I have not seen so far at other bicycle races: For example a huge stone bowl for making sticky rice cakes (Omochi) on a massive wooden stand, at least 50 kg of weight. This was not part of a food stall, but belonged to a racing team. Also I saw some items which one usually sees at bicycle races: for example rollers where riders on shopping bikes got warmed up. As I have never ever been on a roller, I asked if I could have a try and, yes, I could and so I had my first roller experience on a mama chari. Actually the whole atmosphere is more like a Japanese Matsuri (festival), than a race. My favourite group was one team where every member was disguised as egg plant and had Japanese flags attached to their bag with slogans written on them. I called then "The right wing eggplant field" or 右翼なす畑. My favourite bike was the one which had mounted a small wooden Japanese house on the back with a board written "Grilled Potatoes" (焼き芋）. Yatsu gives everything, makes two laps and is back after 25 minutes. Some of the pro teams are fast, after the first lap the first rider crosses the line in under 9 minutes. Then it is my turn. At least it is sunny now and the roads are not frozen any more. The way out of the pit is a disaster. As most people have no racing experience, they ride their bikes just like in normal traffic : Moving suddenly to the left or right, cutting corners, not looking behind - this is dangerous stuff here .... this is even more dangerous than a JCRC F class race. This is like P or Q class at best. The first part of Fuji Speedway is rather nice, a fast downhill, some easy curves. I have never ridden on that bike before, but it feels OK, I try my best, at least aerodynamically. The second part is climbing. Much to my surprise I have to shift down into second gear for the climb. And then even in the first gear. No way to pedal hard, when one cannot extend ones legs. I almost came to a still stand. I jump out of the saddle, but somehow the position is awkward, the handle height is OK if you sit on the low saddle, but with my height, when I jump up, my arms are too short, so I need to lean forward and my chin almost scraps over the front wheel. It feels like pedaling in one of these swanboats. But I am still much better doing than a lot of other riders. I would guess that almost two thirds of all riders are walking up the slope. I come to the straight finish and accelerate as fast as I can, then put my hands at the basket and lean my body into the airstream. One more lap like that and I am back in the pit after 21 minutes. So it took me 10.30 min for one lap in average. My best time at the endurance race with Alain last year here was 7:10 min. We had four fast laps and we are in 23rd position - out of 962 teams. Not bad. Then, unfortunately, the other eight members or our team are doing their laps. They share Winston Churchhill's approach to sports and their performance is exactly like that. Our ranking goes down to above 100, then Yatsuo and me do are four laps, we go up and the down again. This continues until the end of the race, where we finish between 90th and 100th most likely. Nevertheless I had a good time. Some days later back on the road bike I wonder why I am so high above the road and I am almost afraid to fall down - this is how a day on a mama chari can alter your point of view. 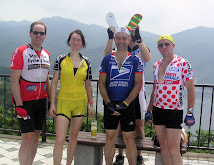 I am pretty sure that with a good bike (6 gears rear derailleur plus long saddlepost) and a strong team of riders from Positivo Espresso and/or TCC we could make a top finish a any Mama Chari race. But we need to act fast, before others find out.